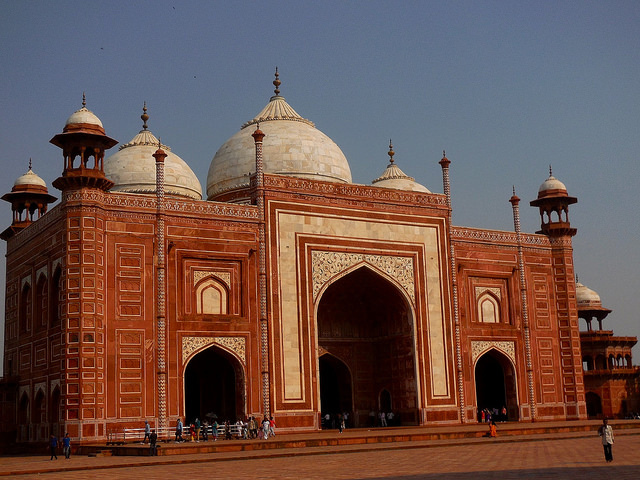 Golden Triangle - Agra, Fatehpur Sikri - Ghumakkar - Inspiring travel experiences. We were planning to have a family holiday trip with my parents, sister and her kids for some time. They were all in Delhi and we found a slot of holidays around 2nd Oct 2015. We were getting four days to go somewhere out of Delhi. Only issue was our going to Delhi from Pune and be back in 4 days. I looked up flight schedules and found that newly introduced Vistara airlines had a convenient flight timings leaving Pune late night and back from Delhi in the evening on return. This being a new full-service airline I went ahead and booked to check out the experience. 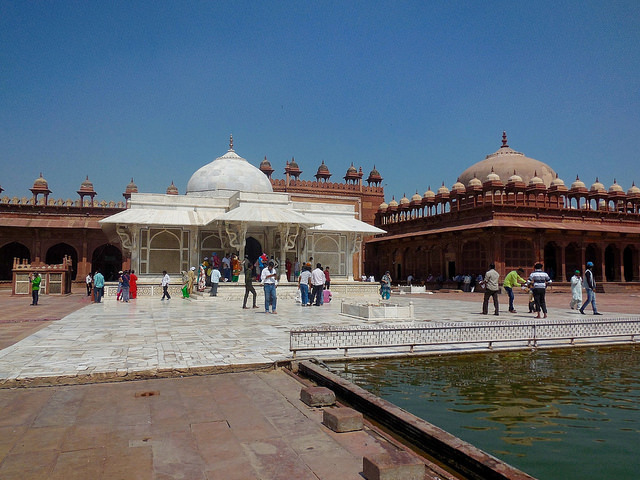 So, we decided to do the famed Golden triangle of Delhi – Agra – Jaipur with Fatehpur Sikri & Bharatpur thrown in between. We flew on 30th Sept late night and reached Delhi by 1:00 AM. This was my first time coming to Terminal 3 of Delhi airport and it was impressive. 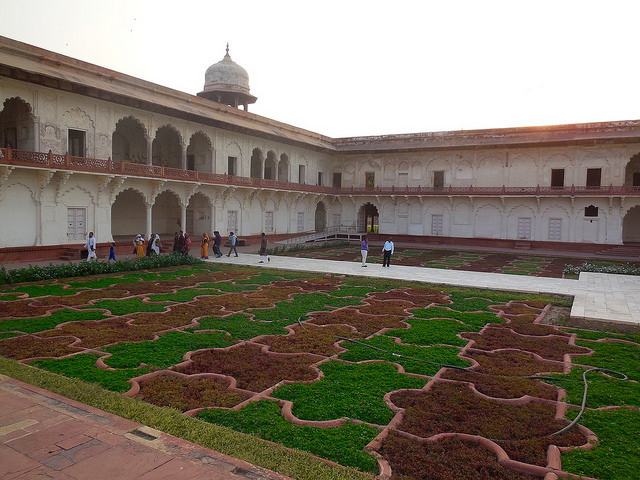 The plan was to just sleep and leave for Agra the next morning. We had an SUV at our disposal and I being the sole driver. After good rest we left for Agra around 10AM. We were located at Mayur Vihar from where getting onto Greater Noida expressway was easy though we lost the way a little. However, once we got onto the expressway we were in Agra by 1:00 PM. The expressway was excellent and it was smooth ride. Once inside Agra, the regular traffic was there and we had some difficulty in locating our OYO rooms hotel near the East gate of Taj Mahal. The rooms were nice and Taj Mahal was visible from the window. After having lunch which we had brought from home and a little rest, we went to Taj Mahal by the battery operated vehicle. But the day was pretty hot and there was lot of crowd. Family was soon exhausted due to heat and crowd so they soon went back to hotel room. 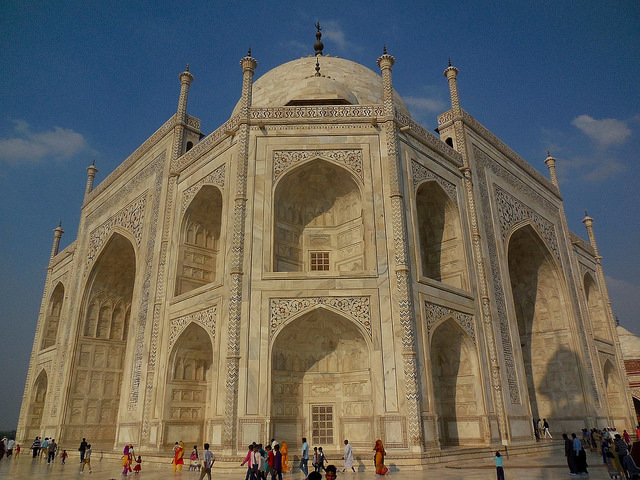 I was visiting Taj Mahal after several 25 years(!) 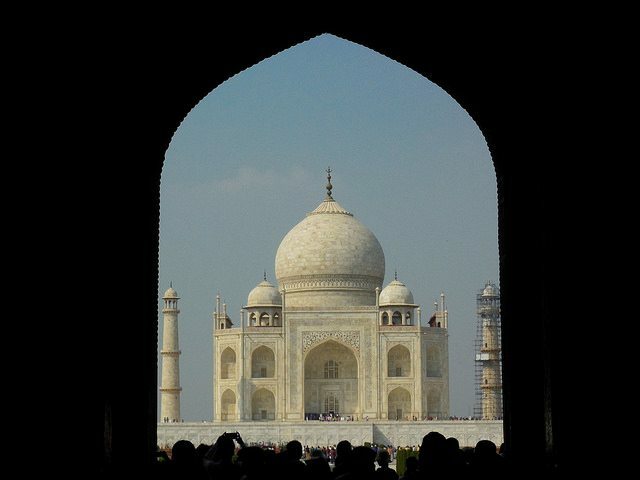 and for my wife it was her first visit so we hung around and explored Taj Mahal from all angles. 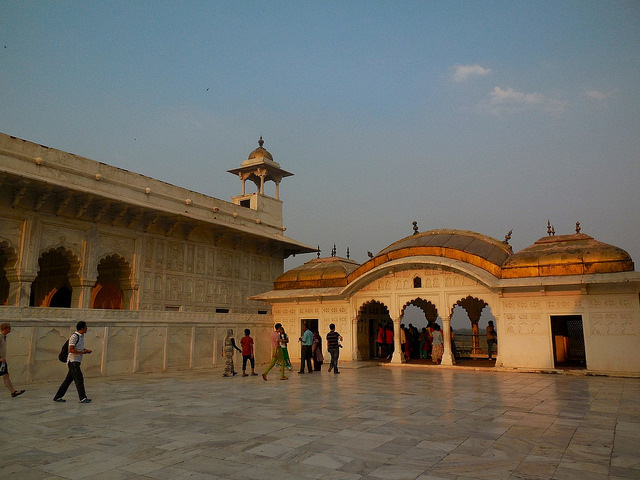 We then decided that we should go around Agra a bit like visiting Red Fort. So, we took a Tonga to go to Red Fort. We enjoyed the ride and Tonga wallah obliged by letting us take pictures with Tonga. 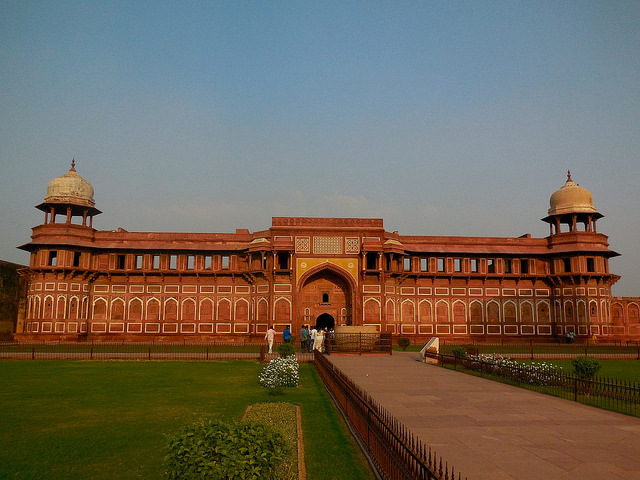 Red Fort was another revelation with so many stories about it. We had hired a guide who was telling us all the places where Shahjahan lived or exiled, where his daughters lived, mosque, sheesh mahal, bombshell damage etc. 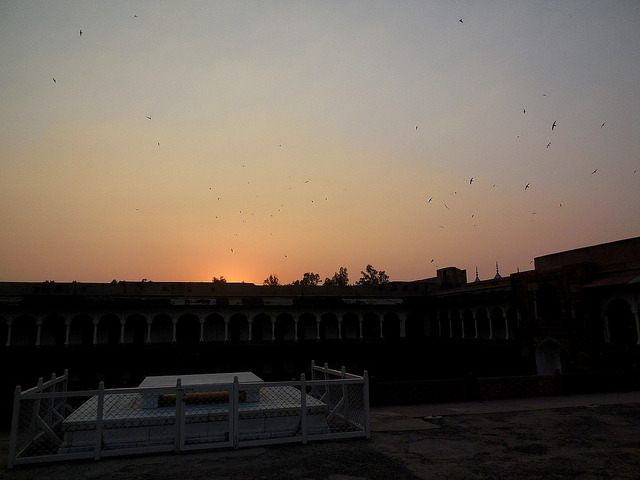 Soon, it was dusk and there were lot of birds circling the fort and its courtyard. 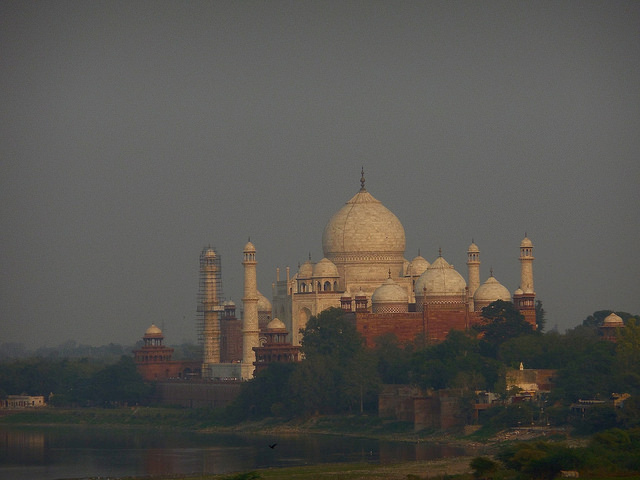 We imagined how it would have been for Shahjahan watching his beloved Taj Mahal and the Yamuna while in exile. Once we came out the Tonga-wallah was still waiting for us. We wanted to purchase famous Agra pethas for which he took us to Panchhi petha store in the town. After that he took us to our hotel. We got the kids a ride on the tonga which they enjoyed thoroughly. After freshening up, we decided to have food at roof-top restaurant admiring the Agra skyline if that is what it could be called. Taj Mahal is not illuminated in the night so it was not visible, but we had a nice time with us being the only guests at the roof top. 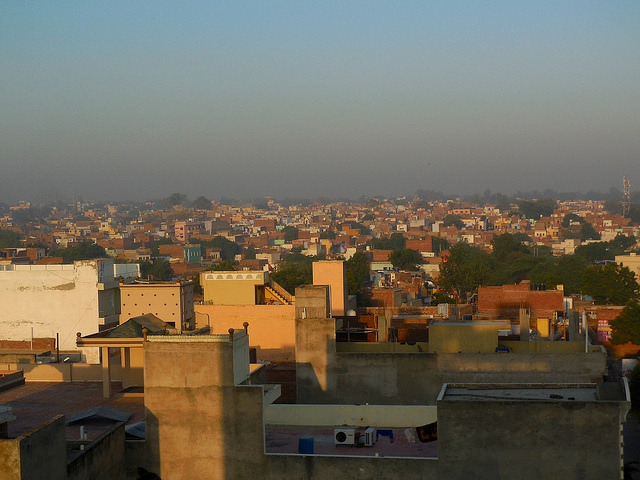 Next day we checked out and left for Fatehpur Sikri. It is around 40 km from Agra. At Fatehpur Sikri we again hired a guide who took us around. 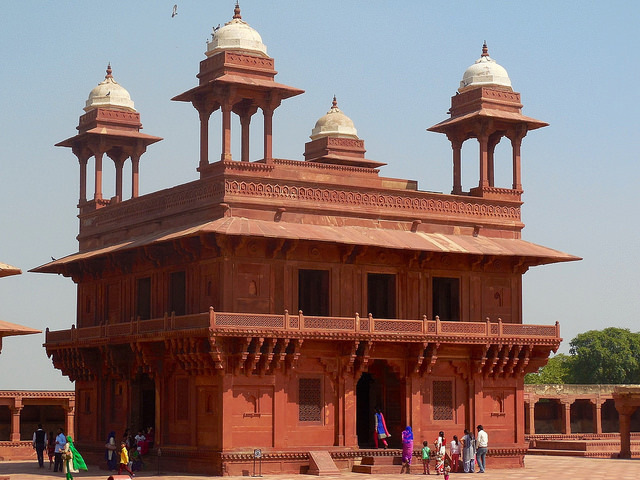 Fatehpur Sikri has two complexes, one is residential and administrative buildings like Diwan-e-Aam, Diwan-e-Khaas, Panch Mahal, Palaces for Akbar’s three wives are there. Whereas other one is religious with Jama Masjid, Dargah of Salim Chishti and Buland Darwaza. There was lot of activity today it being Friday. There was literally a flea market inside with vendors selling souvenirs and decorative and other items to visitors. 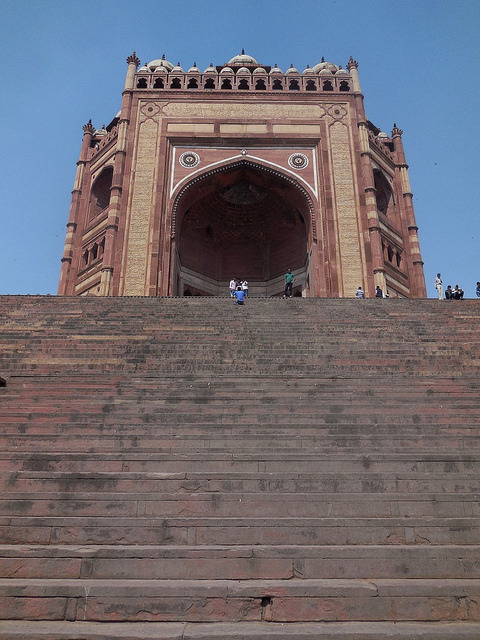 Buland Darwaza was an attraction due to its size and the stairs which one has to climb. Again like at all historic places I wanted to imagine how life would have been at that time. 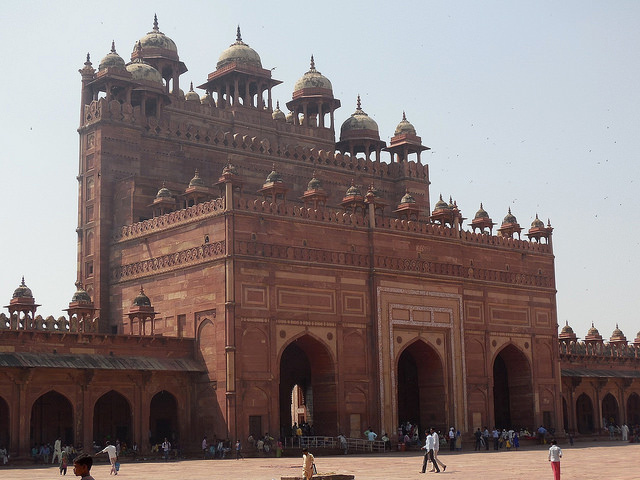 I wanted to explore the town around Fatehpur Sikri and hear many more anecdotes. So, I made a resolve that some day I will come again at this place in leisure with a map and guidebook and explore things in detail. I was hoping to get an in-depth story revealing the beautiful details of the monuments and the cities you visited but instead got a bird’s eye-view which left me with ‘Ye Dil Mange More’. Please write patiently so that we may feel as if walking with you and admiring everything that you want us to see. T3 Terminal is really impressive. Your pics are, indeed, very good. Thanks Sushant. Yeah its a little hurried as was the trip. As I mentioned in the post hope to come back some day with leisure and explore the monuments and absorb everything the place has to offer. 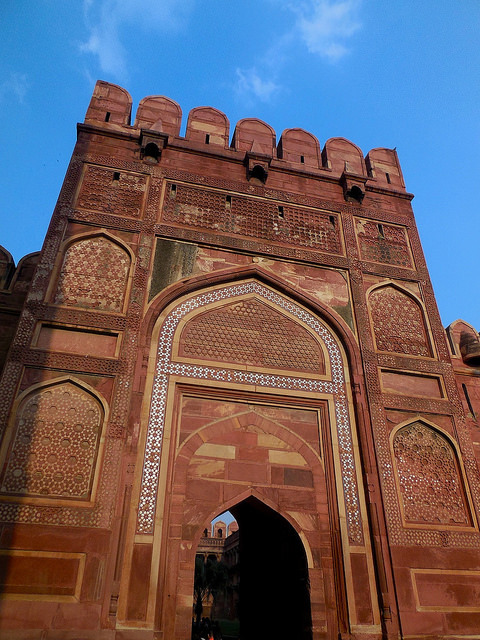 During our visit to Agra, we explored Taj Mahal only and missed the chance to see Buland Darwaja due to lack of time and patience as well since we were fed up of Agra traffic. By the way, all the pics are really very good. 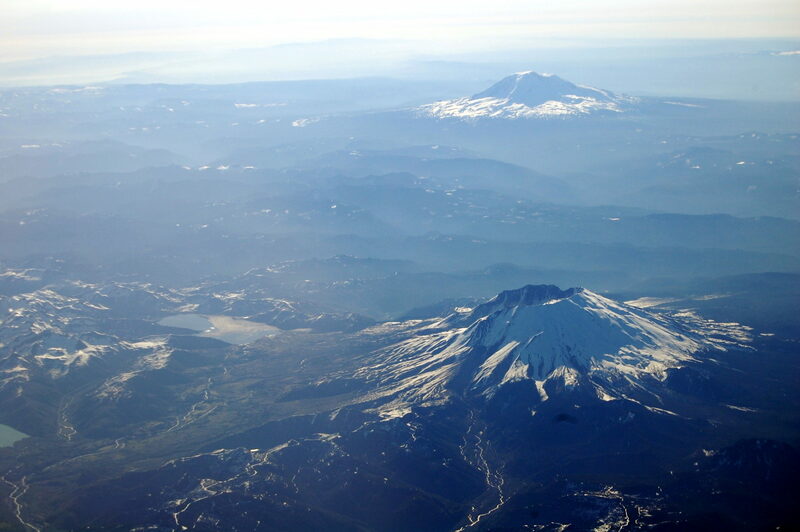 Keep exploring new destinations. Thanks Arun. Its strange but most of the charm is found in such chaotic places. Once I had gone to Kolkata and it was filthy and chaotic but it had its own character. So you were not too far from where I live. But as you said that you planned quite a packed trip. 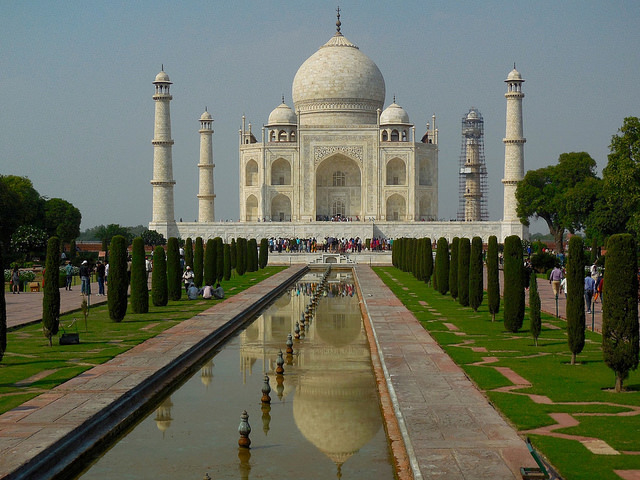 Taj Mahal is Taj Mahal. I finally managed to do the night thing, this Feb. It was not that famed as what we imagined. The air was not clear and though one could see a large mammoth structure under the fatty-milky moon light, that was it. On to Bharatpur now ?